To me, this has to be one of the least traumatic and more productive month of December on record. My novels are DONE !!! All 3 of them! Incredible. Absolutely incredible. And yet because the process happened so incrementally it feels natural. Normal. A huge amount of mental preparation must be happening below the surface before a writer releases a book. Or 3. By release, what I mean is that the book stops being a private thing, and start belonging to everyone. Before releasing it, the book is pure play. Pure dream and creation. Pure potentiality. Once it is released, who knows? There is aftermath. The beautiful secret you cherished for so long suddenly no longer belongs to you. It belongs to the readers who might love it, hate it, curse it, ignore it, and everything in between. The writer dreams of success -- which is, let's admit it, a dream of the book being loved by all and for all eternity no less--. But there is also the very real possibility of a flop. That's because writers are, above all else, dreamers. We not only dream up characters and plot. We dream that others will want to join us on the ride. The mental preparation happens over time, despite yourself, in the minutia of spell checks and page count. It is partly a mental separation. Like a parent sending a child off into the world. The parents has done absolutely everything within his or her power, and at some point must let go. ​The Curator of Broken Things is a family-saga trilogy that takes place over a century and across four continents. Multiple narrative threads take the reader through love, betrayal, and espionage in a story that spans from the last days of the Ottoman Empire to Paris of the Roaring Twenties to the prewar French Riviera to the World War II Allied landing in North Africa and to modern-day Paris and Los Angeles. In this trilogy, three generations of a family’s secrets are unearthed that might bring it together or tear it apart. Everything Cassie believes about her father is turned on its head when she meets an estranged elderly aunt more than willing to expose family secrets that have created riffs across generations. From an ancient city in the Ottoman Empire to Paris in the Roaring Twenties to a desperate escape from Nazi annihilation, Cassie begins to unearth her family’s past and its impact on who she has become. A family flees Paris at the dawn of the Second World War, haunted by secrets that threaten to rip them apart. Seventy years later, Cassie, in modern-day Paris, finds herself alone frantically trying to confront her hostile relatives. Meanwhile, puzzled by the advances of a charming Frenchman, she struggles to cope with the demands of her manipulative ex and gain an understanding of her true self. ​Amidst the chaos of the Second World War, and having taken refuge in North Africa, Cassie’s parents and grandparents enter the French Resistance. As the Nazi threat tightens its noose, they find love and risk their lives and one another’s. In modern-day Paris, Cassie, now on the cusp of a surprising and disorienting love interest, has to conquer her fear of failure and success. When the last shocking piece of her family’s puzzle comes into her possession, Cassie must unburden herself from several generations of family secrets. The ebooks are available for pre-order now. The paperback will be out before the end of the month. Many people are curious about becoming a voice actor, but it’s a skill. It’s acting and producing, recording, and editing. So, you can’t just be a pretty voice. You have to be an actor and a sound engineer too. This is why it was a challenge to find just the right voice actress to produce the audiobook for Hidden in Paris, someone who could juggle all these things and be able to pronounce French words correctly. In the end, I’m thrilled with my collaboration with Phe Caplan. She was so easy to work with and she did a terrific job. Corine: How has your background as an actress helped you with voice acting? How is that different from regular acting and how is it similar? Is voice acting more liberating or more restrictive? Phe: What I love about acting is being able to feel something that I may not get to actually experience in my real life. That can be exhilarating or painful, but I love the emotion of it all. Everyday life is satisfying in its own way, but the drama and intensity of fiction is heightened. That’s why it’s written. It’s a story that needs to be told. And as an actress, I get to live that. Voice acting strips everything down to the bare bones of it all. The emotion, the desires and the way the character views the world. There are no costumes, no makeup, no sets. Just me, the words, and the story behind the words. In some ways, it’s not as much fun, and sometimes I have to work harder to give it breath, but it is liberating that I don’t have to be concerned with how it looks. I don’t have to break up a scene into minute details in order to get the right shot. I just have to relax, feel the moment, and let it go. Corine: You live parts of the year in Germany and you recorded on two continents while raising two young children. Besides the logistical and technical challenges this presented, how do you feel that your experience as a mother and part time expatriate informed how you chose to inhabit the characters? Phe: I had a deeper understanding of what it means to uproot and relocate. There is a strange thing that happens when you move somewhere where you don’t speak the language. At first, there is this clinging to the familiar. Trying to make things exactly like they were at home. Then, as you begin to trust your new place, you begin to embrace the things that are different. That’s where the growing starts. And allowing yourself to love both places is a big one, too. I knew that feeling that Annie had when she first moved to France. The question of, “What will I do now?” lingers for a while. But then she, like I did, found things she loved about France (Berlin) and grabbed onto it. She sunk her teeth into French more than I was able to with German, but the basic tenet is there. I think that goes for Lola and Althea too. They came to France to try to get away from their lives in America. But it wasn’t until they were able to accept their new reality that they were able to grow and accept themselves, wherever they were. And being a mom puts a whole other level of importance on almost everything. Priorities shift from ‘what’s best for me’ to ‘what’s best for them’ and ‘what’s best for our family’. But it’s also important to not let the selflessness get in the way of your mental health and sanity. Moms have to be able to take care of themselves, so they are able to take care of their kids. Both Annie and Lola really come to understand that deeply. Corine: How were you able to get so well into the skin of male characters? Especially French men? Phe: I think the human condition is the same for both men and women, it’s just that men express themselves differently. I don’t know that I necessarily treated them differently. Corine: What parts of the book were the most fun to record, what were the most challenging? Phe: The beginning is always hardest, until I find my groove. I probably recorded and rerecorded the first chapter 10 times before I felt that I was ‘in the pocket’. It’s also tough when a character is really crying hard. It’s difficult to talk through the emotion sometimes. And since this is an audiobook, the words and the clarity are paramount to anything else, so finding the balance can be tricky. But those parts are also the most fun. And describing the food was really fun, too. Especially speaking in French. Those words almost taste good in your mouth! Corine: Did you identify with a particular character in the novel? Phe: I definitely connected a lot with Annie. She and I are very similar in how we deal with things. Humor is important to her. And she wants to feel the truth of her pain but is afraid to move forward. When I was younger, I knew that feeling of the comfort of a deep sadness, because the other option, happiness, is sometimes too scary to imagine. That involves change, which is hard to do. But being on the other side of it now, I understand its importance. If you'd like to find out more about Phe Caplan, here is her website. 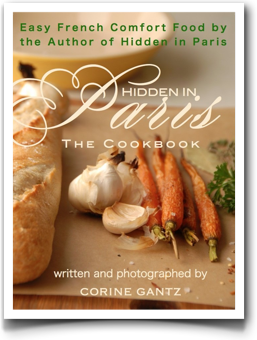 Corine Gantz is the Author of Hidden in Paris and an upcoming trilogy which title is still a secret for a few more weeks. Find out more about Corine and her books on her website. I wanted Hidden in Paris to be turned into audiobook, so, armed with ignorance and a DIY mentality, I thought no big deal. I wrote the whole book, for heaven's sake: I'm pretty certain I can read it and record myself. I recorded myself and it was hilariously awful. My French accent --the one that I have, for years, believed to be light and discreet --is in fact thick as sauce béarnaise. And, to my surprise, I can't seem to say three words without saying heuu (French equivalent of hmm) or my throat emitting clicking noises like some alien species straight out of Star Trek. My DIY ambitions were promptly abandoned. Here is the Hidden in Paris audiobook trailer, please check it out and tell me what you think. PS: my son did the music to the trailer, I love it! Hidden in Paris comes out in Spanish language, and I just opened a box full of sample paperbacks. The book looks great! I love how each country has its own take on the title and the cover. The Spanish title translates as 'a room in paris' and the covers shows the window of the original cover (including the geraniums) but from the inside, and looking out to a beautiful parisian Haussmanian building. Because it was published by Penguin Random House Grupo, the novel will be available in the Spanish language in: drumroll: España, Argentina, Chile, Colombia, México, Uruguay, Perú, Portugal, and Estados Unidos (never heard of that last one). And I'm pretty amazed that Aurora Echevarría Perez translated it to Spanish, she who translated Donna Tart's Goldfinch and Alice Munro. I'm afraid to ask: did she make Una Habitación en París much better than the original? I'll do a giveaway soon. My spanish is oxidado but one of you will be able to tell me. Or maybe DON'T. Okay, enough with the insufferable boast. Thank you Penguin Random House Grupo for having faith in my book, and thank you to my agent Renata for everything! Kristin Espinasse is the author of several books set in Provence. She is also the writer behind the great blog French Word a Day where she gives you a mot du jour and crafts a charming story around it. Enter to win a copy of this book automatically by telling me about the best meal you remember eating right here. As of this moment there are about 180 comments on her blog requesting my book. My own blog has been sleepy lately (okay, don't blame the blog; I've been lazy working on my novel.) so I hope I can get a few requests here. All you need to do to get a chance to win a copy of First French Essais is leave a comment below and tell me about the best best meal you ever had. In a restaurant, at home, at someone's house you decide. I can't wait to hear about great meals (it's lunch time here, let the torture begin!) and pick a winner at random. Click here to leave a comment and automatically enter the giveaway. I plan on doing more giveaways in the future. They're just awesome, they make everyone happy, and they're a chance for me to rekindle with my blog and blogging friends. PS: thank you for all your comments. The giveaway is closed and a winner was picked at random. For some reasons many of you entered by leaving a comment on the post before this one (the one favorite Paris eating places.) That's fine, you disobedient you :) I entered your names too. I'm staring the year with rose-colored glasses firmly planted on my somewhat mishapped nose (note to self, stop obsessing about nose. Nose is fine, Nose will do.) So here is a touch of PINK for you, ladies. I’m not sure how good I am at friendship. For most of my life it was clear that I took more than I was able to give, because let’s face it, I was an insecure mess. I know I am a very entertaining friend, but can I really be here when I am needed? Do I know how to soothe, support and listen the way my friends have soothed me, supported me, and listened (tirelessly—at least in appearance) to me? Although there are three love stories in Hidden in Paris, it is not surprising, given my less than stellar antecedents that the main theme I explore in the novel is friendship between women. Women who, like myself, are not always good at friendship. I did not set out to write a book about friendship between women, but I guess it was the book that needed to be written, and the writing of it allowed me to observe and analyze my feelings at a safe distance. Trust issues and past wounds can get in the way of experiencing friendship, but when you finally meet that gem of a person, your life can be changed forever. I offered a giveaway on the fantastic Breast Cancer support site Pink Link and today I was very touched to read testimonies of women who went through breast cancer ordeals and expressed how friendship helped them pull through the worst times. Please read here on the Cancer Survivor Blog and congratulations to Tammy, Nancy and Crystal, winners of the Pink Link giveaway. There were more winners in December: Congratulations to Silvia, an expatriation specialist, and Carol, a talented artist ) for winning a copy of Hidden in Paris on the website Expat Forever and than you Véronique Martin-Place, author of the book Finding your Feet in Chicago, for hosting it. The time of giving and receiving is not over, girlfriends! I've just created a new giveaway on Goodreads, here is the link. You have to be Goodreads member to participate. For picture credit on this post, please follow this pinterest link This is my pinterest account and so much easier than to chase down credits. Chasing credit is so time consuming that I end up not blogging at all, so this is my compromise. Haha, interesting how I'm now measuring productivity by how little I blog rather than how much I do. No post since January, so it must mean I'm getting better at focusing. I'm reading a fascinating book about willpower called.. well... WillPower (Rediscovering the Greatest Human Strength). It explains a whole lot about how we consider a lack of willpower a character flaw, when really it is ruled by physiology rather than psychology. the book explains how we have a set amount of daily willpower within us and all the ways we unconsciously deplete it. I'm not saying any more, you have to read the book. It is truly altering the way I look at work ethic, dieting, effort versus laziness, motivation etc..
For example, I have postponed exercising. I've been traveling too much, ten day out of the month, and it's taking every bit of will power I have not to be distracted out of my writing schedule. So I'm giving myself a break about my decision to start exercising daily. I'm only human. A fat human riding a wonderful, creative wave and hurrying to record it all before that bubble bursts. How does the saying goes: I'll rest when I die. Well in my case I'll exercise when the muse turns her back on me. 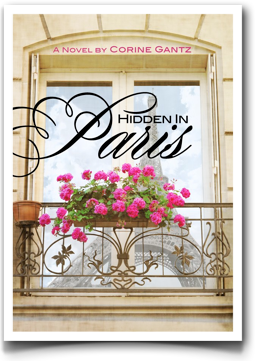 Chez Loulou announced the winners of the Hidden in Paris giveaways on her blog. Congratulations to Ashley of Summer in the Garden, Guilia of Bricolage and Aiden of Conjugating Irregular Verbs. I think it's kinda surreal that the winners of my novel could all be a characters in the novel: Like my main character, Ashley is devoted to food and gardening , like my main character, Aiden is an American mom bravely making a life in France, and like my main character, Giulia is a passionate, smart woman with a wry sense of humor. The giveaway is taking place at My Love Affair with Books. and is going on until June 17th. But you have to be in the U.S. or Canada. Just leave your email address. You don't have to be a member. Okay, go win this! You can blame the drool on Laura Florand. She and I are living strangely parallel lives I found out: She is American married to a French man. I am French and married to an American. 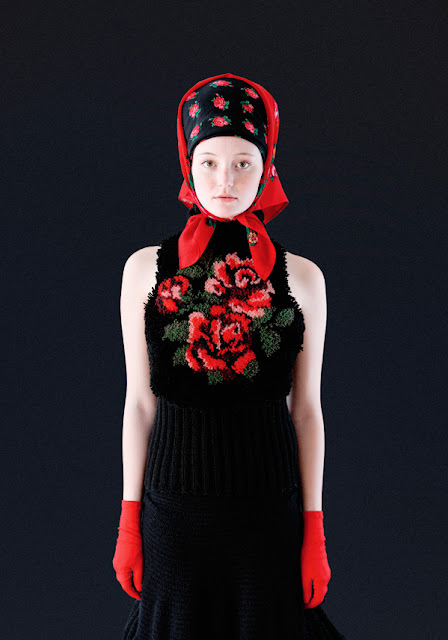 She’s an expatriate who now lives in Paris. I am an expatriate now living in L.A. She’s afflicted with an uncontrollable chocolate issue. I suffer from an uncontrollable chocolate issue that borders on pathological. Her hair seems the kind that requires massive amounts of antifrizz. My hair’s does the Afro thing on a good day. She’s a blogger, I’m a blogger. She also wrote a novel I just read, (her story) about an American woman who falls in love in Paris. I too wrote a novel about a (fictional) American woman who falls in love in Paris. One obvious difference between Laura Florand and myself is that one can actually go to a store and buy her book, Blame it on Paris, whereas my book is in a drawer waiting for an agent to find it there. Florent is funny. She has a wonderfully self-deprecating sense of humor and a genuine talent to make you fall in love with her characters. The way she mightily resists all throughout the book the wonderful things that offer themselves to her on a silver platter—including true love and the kind of in laws that are the stuff of legend —felt very familiar to me. I recommend Blame it on Paris book whole-heartedly. Read it and you’ll laugh, really laugh. It's a promise! To find out where those photographs of pate d'amande et fruits confits were taken, (hint: a market like no other located in the South of France.) go to Laura's Blog. You might want to bring a bucket.. for the overflowing saliva.